In order to effectively support analytical workloads, storage must meet three basic requirements: compelling data economics, enterprise resiliency, and easy infrastructure integration. But, unfortunately for legacy architectures, most predictive analytics models request data faster than a legacy system can provide it. 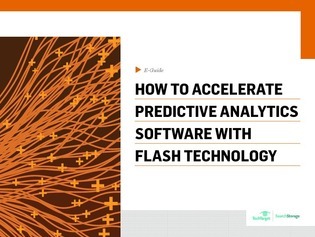 In this guide from the editors at SearchStorage.com, John Edwards highlights the process of accelerating predictive analytics software with flash technology. Read on, as he explains how flash meets the storage requirements needed to support these workloads, and where a flash investment may make the most sense in your enterprise.